At long last, The Legend of Korra's Spirit Book brings our Avatar into the Spirit World, where she will have to battle against her own impatient nature if she wants to save the world. 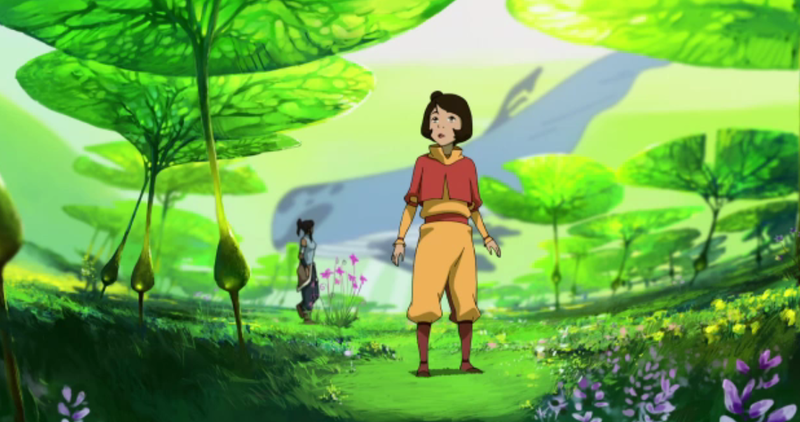 And along the way, she and Jinora encounter some characters we last saw in Avatar: The Last Airbender. This season is really at its best when it is at its most dream-like. First, we got the artistic and mythological story of Wan, the first Avatar, and now we get the Spirit World, where Korra and Jinora are deprived of their bodies (and thus their bending). The spirit designs are lovely (though I'm still itching for something as intense as Koh the Face Stealer), and I occasionally saw splashes of watercolor across the sky, especially when we got to the murkily colored spot where Vaatu is imprisoned. But what was most interesting about this episode is how Korra and Jinora responded to their time in the Spirit World. For Jinora, the Spirit World is the place from her grandfather's adventures, and her easy connection to the spirits lends her an easy boldness that Korra does not possess. Along with Varrick, Jinora has been one of the breakout characters of this season, and more than Korra or Tenzin, she is the most ready successor to Aang. She may not have the anxiety that comes with her grandfather's messianic role, but she shares his resourcefulness, his sense of adventure, and his fondness for cute things. When Jinora stood up to Wan Shi Tong and explained how a radio worked, it reminded me of A:TLA in a great way, showing off the heroic qualities of children. I hope that the writers decide to keep Jinora on as a mentor to Korra, especially if the show eventually takes on a more globetrotting structure. While Korra's character development between last season and this has been sloppy, it's sort of a relief to see that this episode confirmed that the writers did at least have a plan in mind for impetuous, violent Korra. While Jinora confidently makes her way through the Spirit World, Korra is quickly scared into a child-like version of herself. It makes sense since, in her heart, Korra is still very much a child. She's frightened, impatient, and prone to tantrums, and she needs a guide to leave her through the dark spirit woods. 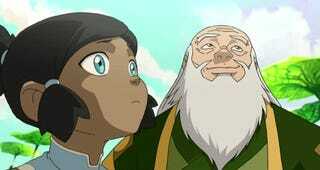 Fortunately for her, a guide quickly appears in the grandfatherly form of Iroh. Iroh's appearance in this episode reminds me how much I miss the late Mako Iwamatsu's Iroh. In this dream realm, this seemed like a dream version of Iroh, one who doesn't quite sound right. Alas. And while I can entirely believe that Iroh would choose to spend his afterlife in the Spirit World, making friends and drinking tea, his sly humor seems to be missing without the severe Zuko by his side. But Iroh is still a good choice to guide Korra; after all, he is spiritually aware and avuncular, two qualities the childish Korra needs. Korra's lesson for this season is that her anger and rush to fight can actually exacerbate the problems in the world, and she has to learn to confront her foes with a sense of peace and kindness. If she means to find victory over Unalaq and Vaatu, I sense that her bending abilities won't be enough. It's an interesting lesson, because at the same time, one of the themes of this season has been the tension between an Avatar's duties and their sense of love. The Tenzin arc has focused on that, unraveling Aang's failure to be both warm father and architect of peace. And Unalaq exploits Korra's sense of familial love, ransoming Jinora's soul so that Korra will open the Norther Spirit Portal, enabling Vaatu's escape during Harmonic Convergence. When asked to choose between Jinora and the world (or, at least, the ease of saving the world), Korra chooses Jinora. We know from last episode what Unalaq would choose; his children are mere lieutenants in his quest to free Vaatu. However, Korra is rescued thanks to an act of kindness. Korra doesn't grow out of her childlike state to become teenaged Korra until she returns a baby dragon-bird to his nest, and she is saved from Unalaq by mama dragon-bird. For Korra, who spent the first few episodes of the season pushing her allies away, it's a significant moment. Now, with Jinora trapped in the Spirit World and Harmonic Convergence approaching, we have a Korra who is likely driven less by anger than by love. Love for Jinora, who bravely guided her into the spirit world, and love for all the people she has let down and whom she must protect from Vaatu's dominance. I imagine that she will have to return to the South Pole to enter the Spirit World with her bending intact, and she will have to regather her allies—and perhaps make new ones in the form of Eska and Desna—to confront Unalaq and Vaatu. As we're cruising toward the endgame, I do hope that we get a little more exploration of Unalaq's relationship with Vaatu and the spirits. Unalaq hinted that there is more to the conflict behind Vaatu and Raava than Jinora read about in the Spirit Library, but so far, we don't have any indication that Vaatu is anything but conflict and chaos to Raava's peace and balance. 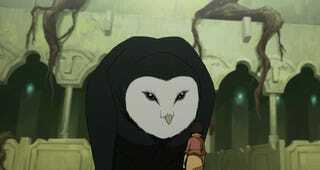 And we know what Aang did to arouse Wan Shi Tong's ire against the Avatar, but what did Unalaq do to win over such a powerful spirit? Unalaq started off as such an intriguing character, less a black hat than a very dark shade of gray, and it has been disappointing to see him portrayed less as a religious extremist than a villain. I keep hoping that we'll get some rationale behind his madness, although I'm not holding my breath. At this point, I'm just crossing my fingers that the final confrontation proves to be a fulfilling one, one that utilizes the lessons Korra has learned over the course of the season—and that she doesn't completely backslide once this confrontation is over.